In the opening shot we soar over Elliott Bay toward the city. Above the jagged array of skyscrapers looms an inky storm cloud. The soundtrack leans heavy on the strings, recalling the moment in comic book movies when the supervillain unleashes their dastardly plan. In the next shot the silhouette of our governor, tall, flanked by two women, charges along a rain-soaked pier—presumably toward battle with the existential threat. In Jay Inslee’s presidential campaign announcement video, released in March, those two split-second shots are about as thrilling as it’s going to get. The remainder stars the two-term governor—stiff, low affect—jawing about a topic that’s somehow both the most important in our lifetimes and among the least alluring, a topic long relegated to uninspiring charts and graphs. 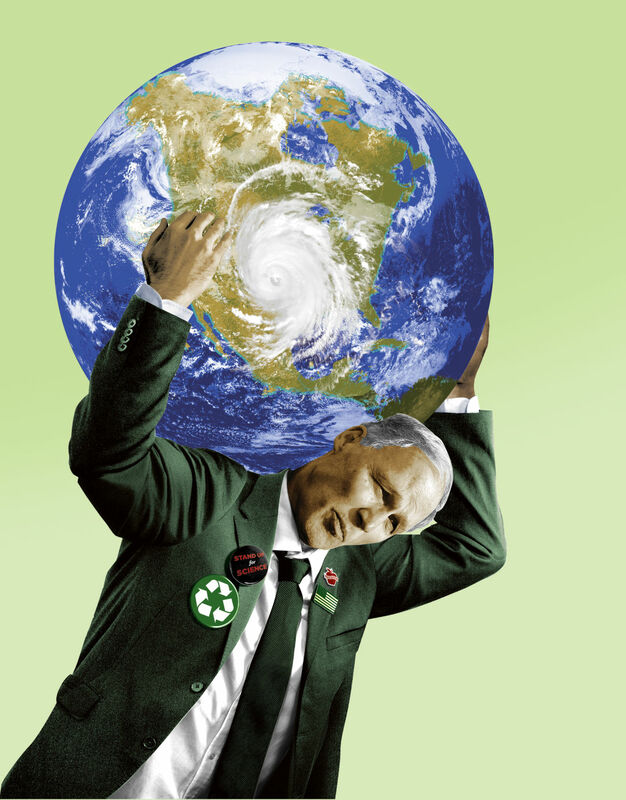 Inslee has made climate change his sole campaign issue. Yet the subject has never proven a winning strategy. Moderators didn’t ask about it in the previous presidential debates; it’s never stood as the hallmark of a successful national run for office. Flouting that history will require the arguably bland politician to transform a traditionally unexciting subject into something compelling enough to win votes in 2020. Inslee hasn’t lost his mind. There’s evidence that the winds of public opinion have turned. In a Yale and George Mason survey released last December, 69 percent of Americans are at least “somewhat worried” about global warming—an increase of 13 percent from five years ago. More telling, in an earlier Yale and George Mason poll leading up to the 2018 midterm election, left-leaning Democrats said, out of 28 issues, global warming was their number four concern. Closer observers of Inslee see it differently. “Even within Washington state, if you were to say, ‘What is Jay Inslee known for?’ nothing rolls off the tongue quickly,” says Mark Smith, a political science professor at the University of Washington. Smith, who specializes in public opinion, does acknowledge Inslee’s impassioned climate rhetoric over the years—in Congress, as governor—but significant new policies have remained elusive. Surmounting all that will require a charismatic leader, says UW professor and presidential historian Margaret O’Mara—someone like Franklin D. Roosevelt, whose charm and gifted rhetoric helped buoy the country out of the Great Depression. It’s unclear whether Inslee will change on the campaign trail. Seems unlikely. But even if our governor suddenly assumed the appeal and swagger of a George Clooney, could he or anyone else avoid putting the public to sleep with speeches about the climate? 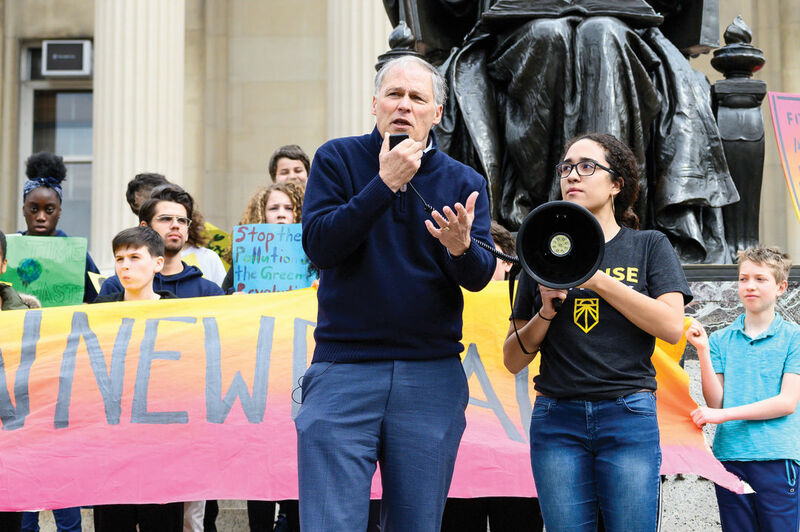 Inslee at Columbia University’s Climate Strike, March 15, 2019. Blame Al Gore. That’s right. The end of the world is a snooze. A big bore. And we’re all yawning into the apocalypse. All thanks in part to Al Gore and his 2006 global warming documentary, says Randy Olson, a Los Angeles–based filmmaker, author, and former marine biologist whose work is aimed at helping scientists make arcane subjects like, say, the ozone layer as palatable to the public as a Hollywood blockbuster. Olson believes the former vice president and failed presidential candidate’s doc An Inconvenient Truth not only sealed global warming as a partisan issue—Gore takes a swing at the Bush administration within the first 10 minutes—it also presented things in such a dull, tedious manner that the climate movement has never recovered. Our governor wants to be president. And from his candidacy kickoff video—at least in those first fleeting shots—he appears to recognize the problem Olson identifies. Will submitting to cinematic tropes be enough? In this movie, in this campaign, Jay Inslee is cast as the hero. He’s marching off to confront a powerful nemesis set on destroying life as we know it. Through sacrifice and determination heroes do sometimes halt the enemy but more often they just slow it down, put it in a box, only to see it reemerge in the sequel. In such stories the hero may achieve a modicum of success. But he never gets what he wants.